Now it seems that SFR really gets around. First he was in Canada, then the U.S. Now he’s across the Atlantic, and I notice he was smart enough to visit Spain after the Running of the Bulls. Oh, yeah, SFR is one clever piece of parchment, and I’m sure he knows how to get in and out of tight places. I only have one question: where is the paper doll to build him up? “Given that I’m going to be abroad for the next six months, it’s no bad thing to be single this year,” he says ruefully. “It’s a peripatetic existence I’ve seen others struggle with.” Ooh, words like peripatetic make my heart skip a beat, and he actually knows what they mean! So all you paper dolls listen up. You’ve got a shot in six months. Wonder what kind of vellum is alluring to him. Something to think about when you quit dreaming about Lucas. Apologies to Patricia Nicol who wrote the original Times piece. Candid shot is mine, and I can’t think of a more fitting “frame” than the “horns” from a deer hunt. This post was Nat inspired. Yeah, I’m sure that’s obvious, but I still wanted to say it. Thanks for the good times, Nat. Thank you for being a good sport. Well, I assume you’re a good sport. edit: I’ve changed the link to the Times Piece so that it is accessible again, and I’m grateful to the ladies at Richard Armitage Central, who made it possible for me to have something to link. Thank you, Ladies for all the great work you do!! SFR & Nat are the true real reasons I started getting involved following the whole Richard Armitage blog world! Since I’m in Canada, I would often try and seach youtube to get info on spooks and the various actors (Matthew Macfadyen & Rupert Penry-Jones) who worked on the show. 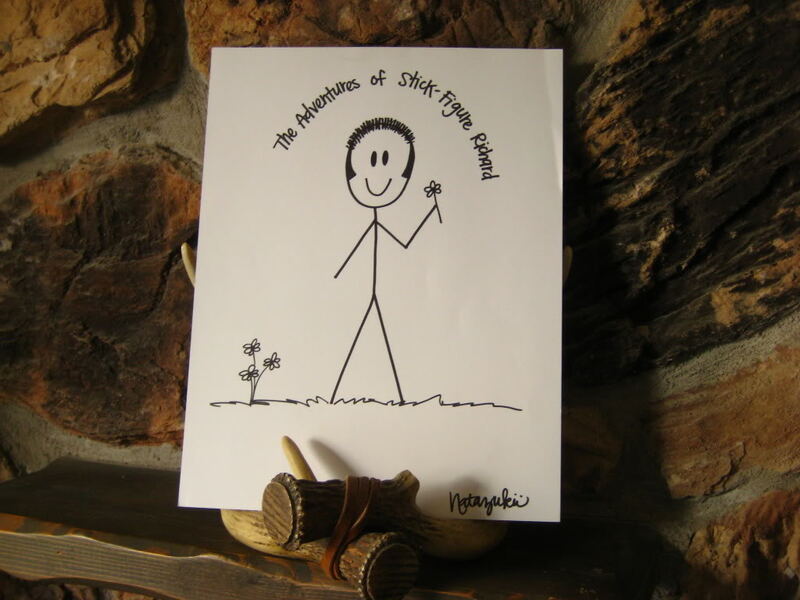 First i would watch fanvids and think cool….and then one day I saw Stick Figure Richard – and that sealed the deal! I visited Nat’s blog – the first blog I ever visited – and discovered the wonderful world of RA blogs! And then the extRAvaganza came soon after and I happily discovered other smart, funny, sincere & sarcastic, talented, writers, artists, commenters, video makers, photoshoppers who while enjoying the “body” of work ;) of Richard Armitage had so much more to share. And now I have friends from around the world! It’s the modern day version of pen pals really…..
All because of a stick figure…. Nat is such an inspiration. Yes, Nat is truly inspirational! She started her blog in July and I found her about a month later and saw the evolution of SFR. I was honoured to have him visit my blog for Canada Day, I hope he wasn’t bored with that history lesson. Hopefully he’ll come back next year and I’ll show him a better time! I too, would like to see a paper doll version with clothes! Like that Mountie Uniform and the neat Spanish outfilt he’s wearing now. Of course he’d have to come with Thornton’s get up, and Harry’s Stripey sweater, Gizzy’s leathers, Lucas jacket and jeans with added cell phone and gun. Oh the accessories!!! Nat is sitting on a goldmine!! Thanks for the feature, RA Frenzy. I’d love to stay and chat, but I have a fandango lesson in a few minutes.